When the fog rolls off the ocean and into the Napa Valley, the weather on Howell Mountain is generally sunny and cool. The appellation owes its distinctive climate to the fact that it is positioned well above the valley floor. Because of its altitude, generally, evening temperatures are warmer and daytime temperatures are much cooler—leveling out spikes in heat that tend to be more exaggerated at lower elevations. Although it gets nearly twice as much rainfall as the valley below, the soil tends to be dry, because rocky, porous soil conditions allow for adequate drainage and less accumulation. Seasonally, cooler spring temperatures cause buds to break later than average, and warm summer nights produce fruit that demonstrates a great balance between acidity and sugar. All of which, translates into a rich diversity of complexity and flavor in your glass. From the ground up, soil can have as much of an effect on the variety and intensity of grapes as the weather. 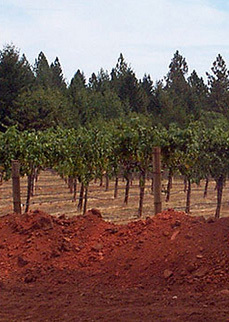 This is clearly evident on Howell Mountain, where there are two main soil types. The first consists of decomposed volcanic ash, called “tufa”, and the second is red clay that is high in iron. Because both soil types are nutrient poor, they stress the vines, producing intense wines from small clusters and berries. In the end, the altitude, and thin, rocky, and dry soil conditions create wines with firm structure, incredible varietal intensity, and excellent aging properties.